Australia Wide on all orders Under 21kg. Mon - Fri 9:00 - 16:30. 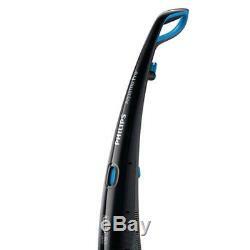 Philips FC7088 AquaTrio Pro Vacuum/Mop/Dryer System. Model No: FC7088/71 Brand: PHILIPS. AquaTrio Pro simultaneously vacuums, mops and dries, saving au to 50% time and effort. Powerfull and gentle microfiber brushes to effectively remove dirt and stains. 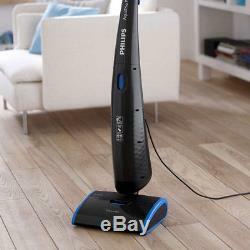 For perfect visible wet cleaning results on all hard floors. Vacuums, mops and dries in one go. 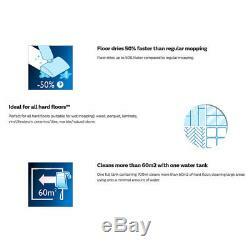 Visible wet cleaning for hard floors. 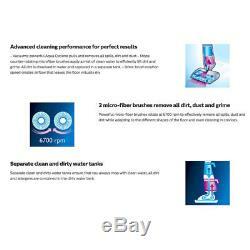 3-in-1: vacuums, mops & dries Triple-Acceleration Technology Visible wet cleaning All hard floors. 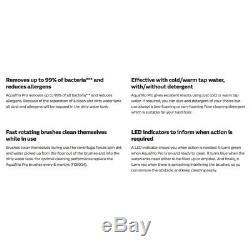 Vacuums: powerful Aqua Cyclone pulls and removes all spills, dirt and dust - Mops: counter-rotating microfiber brushes apply a mist of clean water to efficiently lift dirt and grime. All dirt is dissolved in water and captured in a separate tank. Dries: brush rotation speed creates airflow that leaves the floor virtually dry Powerful micro-fiber brushes rotate at 6700 rpm to effectively remove all spills, dust and dirt while adapting to the different shapes of the floor and even cleaning in crevices. Separate clean and dirty water tanks ensure that you always mop with clean water, all dirt and allergens are contained in the dirty water tank. Floor dries up to 50% faster compared to regular mopping. Perfect for all hard floors (suitable for wet mopping): wood, parquet, laminate, vinyl/linoleum, ceramics/tiles, marble/natural stone. One full tank containing 700ml cleans more than 60m2 of hard floor; cleaning large areas using only a minimal amount of water. Highly-efficient power usage saves you up to 50% in energy consumption compared to vacuuming. You also use up to 70% less water compared to wet mopping. Simply place the appliance on the specially-designed flushing tray, pour a cup of tap water into it, and switch it on for a few seconds. 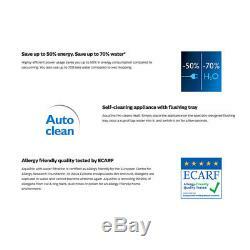 AquaTrio with water filtration is certified as Allergy friendly by the European Centre for Allergy Research Foundation. 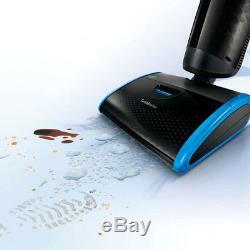 Its Aqua Cyclone encapsulates dirt and dust, allergens are captured in water and cannot become airborne again. AquaTrio is removing 99,95% of allergens from cat & dog hairs, dust mites or pollen for an allergy friendly home environment. AquaTrio Pro removes up to 99% of all bacteria and reduces allergens. Because of the separation of a clean and dirty water tank all dust and allergens will be trapped in the dirty water tank. Brushes clean themselves during use. The centrifugal forces spin dirt and water picked up from the floor out of the brushes and into the dirty water tank. For optimal cleaning performance replace the AquaTrio Pro brushes every 6 months (FC8054). AquaTrio Pro gives excellent results using just cold or warm tap water. If required, you can also add detergent of your choice but use always a low-foaming or non-foaming floor cleaning detergent which is suitable for your hard floor. A LED indicator shows you when action is needed. It turns green when AquaTrio Pro is on and ready to clean. It turns blue when the watertanks need either to be filled up or emptied. And finally, it turns red when there is something interfering the brushes, so yu can remove the obstacle and keep cleaning easily. Input power (IEC): Max 500 W.
Mopping element: 2 microfiber rotating brushes. Surface coverage per tank: 60 m². Packaging: > 90% recycled materials. User manual: 100% recycled paper. Clean water tank capacity (max): 0.65 L. Detergents that can be used: clear detergent or just water. Dirty water tank capacity (max): 0.8 L. Action radius: 9.5 m. Dimensions of product (LxWxH): 305 x 320 x 1150 mm. Dimensions of packaging (LxWxH): 790 x 390 x 395 mm. Weight of product: 6.7 kg. Please make sure the electrical information i. All parcels are dispatched from Moorabbin VIC 3189. What do I do if my item doesn't arrive within the Estimated Time. First of all please make contact with your local Post Office and check they are not holding your parcel for you. Advising the item has not arrived. 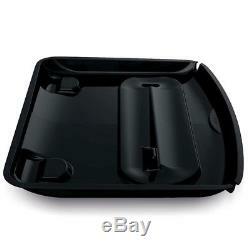 We will then contact Australia Post and follow it up for you and advise the outcome. JOIN NOW TO RECEIVE UPDATES AND OFFERS. 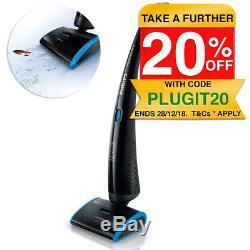 The item "Philips FC7088 AquaTrio Pro Wet/Dry Vacuum/Mop/Dryer Clean/Cleaning Hard Floors" is in sale since Wednesday, February 14, 2018. 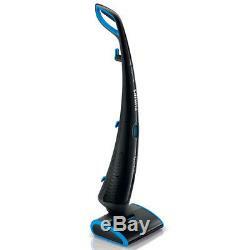 This item is in the category "Home Appliances\Vacuum Cleaners\Handheld Vacuums".electronic" and is located in Moorabbin.